Thought this image had been added to the group, obviously not. Gives great views of the old Wisemore including the schools. 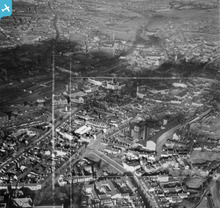 An excellent picture of an area which is now virtually unrecognisable. 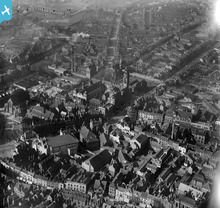 [EPW011847] The town centre, Walsall, 1924. This image has been produced from a copy-negative. 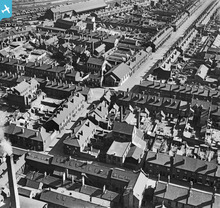 The only aerial view to show a little bit of Sandwell Street, Caldmore. Another excellent picture that shows Park Street in the foreground before the railway was built over just up from The Priory Hotel. The tunnel out of Walsall Station going north was at this time much shorter than it is now. Now I know what my mother meant when she used to say "we used to stroll over the golf links". Not strictly accurate as the course wasn't a links course, but I know what you meant Mom! 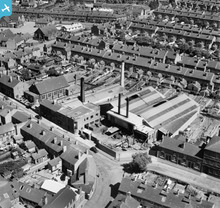 [EAW039986] The H. W. Lindop and Sons Junction Foundry off Pleck Road and the surrounding area, Walsall, 1951. This image was marked by Aerofilms Ltd for photo editing. 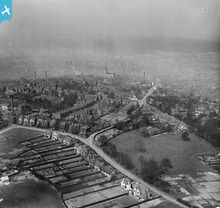 New views of the town now appearing, this one shows the area around Wolverhampton Street and Road. 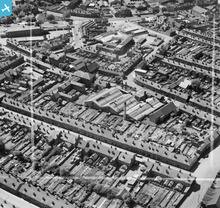 [EAW030201] The Castings Ltd works on Selborne Street and surrounding terraces, Walsall, 1950. This image was marked by Aerofilms Ltd for photo editing. Chuckery area and Castings Limited from yet another angle. 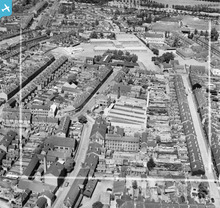 [EAW030197] The Castings Ltd works on Selborne Street and surrounding terraces, Walsall, 1950. 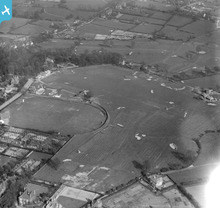 This image was marked by Aerofilms Ltd for photo editing. Another pin sharp image taken from Chuckery looking towards the town, cropped just short of St. Matthews Church. 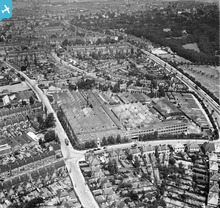 A close-up of the Chuckery area focusing on Selborne Street and the Castings factory. 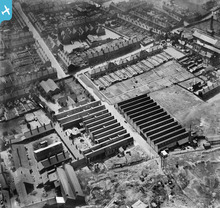 [EAW030203] The Castings Ltd works on Selborne Street and environs, Walsall, 1950. 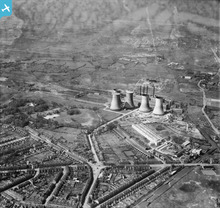 This image was marked by Aerofilms Ltd for photo editing. Great view of Chuckery area and so clear too. Excellent close-up of J. A. Crabtree, even showing the Walsall Corporation bus driving down Lincoln Road. Taken at the same time as the other picture of Jacksons and Bates but from a different angle. 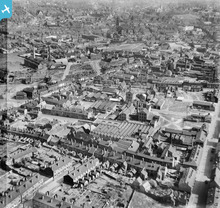 [EAW020361] The town centre, Walsall, 1948. 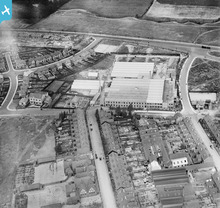 This image was marked by Aerofilms Ltd for photo editing. If anything this 1948 view is better than the other one saved. 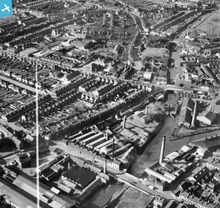 Shows in great detail the area around Edgar Stammers factory. Great view of this area of Walsall. 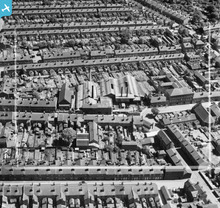 Never realised there were houses on the corner opposite the now demolished Methodist Church. 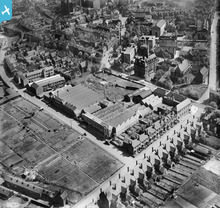 [EAW020359] The John Shannon & Sons Ltd Clothing Factory on George Street and the surrounding town, Walsall, 1948. This image was marked by Aerofilms Ltd for photo editing. 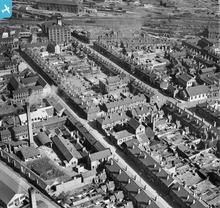 Good close-up of the area around Shannons clothing factory. Good view of the Birchills with Leamore and Bloxwich in the background. 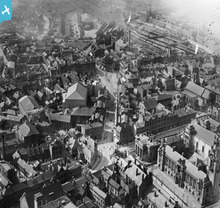 Showing more of Frederick Street towards Navigation Street and the town. 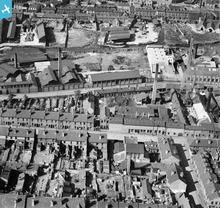 A different view of the Walsall Leather Dressing Co. showing much more of Bridgeman Street, including The Boak factory and the railway goods sidings. 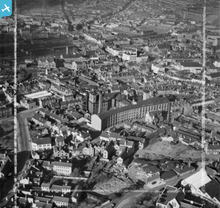 Looking towards Wolverhampton Street, perfect shot of Kirkpatricks. Not as sharp as some shots but interesting because of its unusual viewing angle. This shot around Bridgeman St and Queen St is about as sharp as you can get, even see the Anderson shelters in the gardens, brilliant. 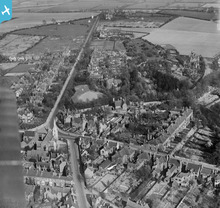 Unusual view looking towards Ryecroft, Coalpool and Leamore also showing the streets around St. Peter's Church. 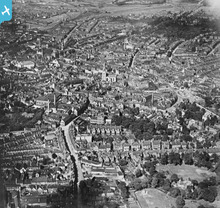 Another brilliant view of a Walsall long gone and so sharp too. 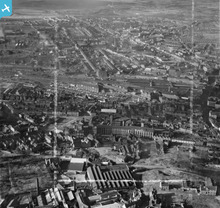 Another great picture of the factory and Broadway North in pin sharp detail. 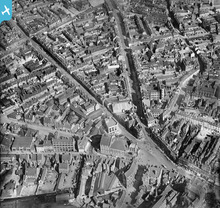 [EAW020366] Bradford Street, Lower Hall Lane and the town centre, Walsall, 1948. 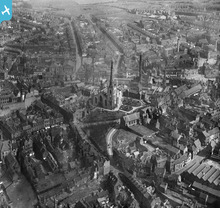 This image was marked by Aerofilms Ltd for photo editing. 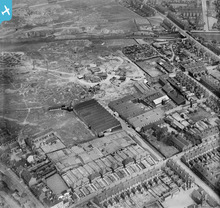 Yet another interesting shot taken at a later date showing the land between Peal Street and George Street cleared of housing etc. Same title as another shot presumably taken on the same day in 1921 but from a different angle. St. Peters on Stafford Street which is in the foreground with The Butts in the background. Finally worked out the location of this one, see the blue flags. 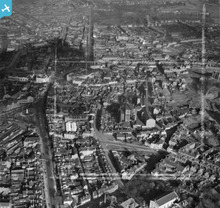 [EAW020365] The town centre, Walsall, 1948. This image was marked by Aerofilms Ltd for photo editing. 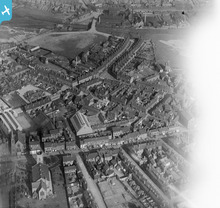 Good later image from 1948 with focus on Caldmore Road area. 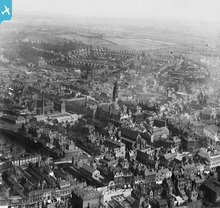 Another great view of the town from a different angle showing one of the more affluent areas of Walsall. 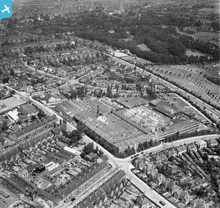 Clearly seen on this photo is the land opposite the Walsall Litho' that was later occupied by the Co-op Dairy which opened in July 1937. 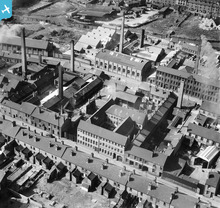 Crabtree's factory and Tong Street with Chuckery Schools. Five years later than one of the other photos in the group and already the building next to the Paul Pry pub has gone along with the Jolly Bacchus pub in New Street. 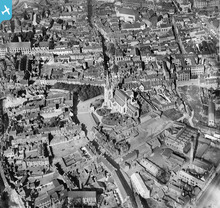 Another great view of the area around St. Matthews, Gorton's Yard, Hill Street, Temple Street, Church Street and Hill Street prior to demolition in the 1930s. 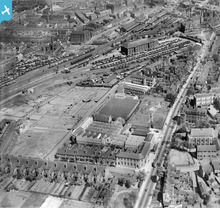 A great photograph of the old town showing an area to the right of the pic' known as Gorton's Yard which was demolished around 1933 I think. 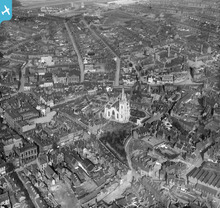 Another photograph showing at lot of old Walsall now long gone. 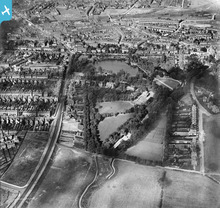 Difficult to think looking at this picture that the area shown between Bradford Street and the railway, was the site of the old Walsall Racecourse which ran from circa 1754-1876. 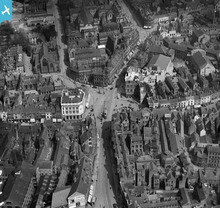 This area shows Bridge Street, Lichfield Street, Leicester Street, the start of Upper Bridge Street and the very bottom of Freer Street. 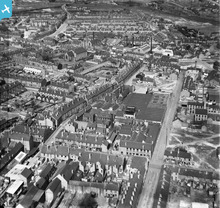 For anyone interested in old Walsall any of the photographs of the town on this website are worth their weight in gold. 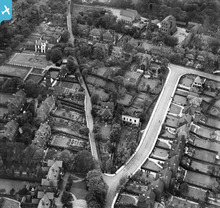 This one shows the Highgate Road/Avenue area complete with Highgate Brewery, the windmill, the Eylands old house once known as Hopelands and many other sites of interest and all before the houses on the one side of Highgate Avenue were built. This area is of particular interest to me as I was brought up in Sandwell Street, very close to this area......but not quite as posh!